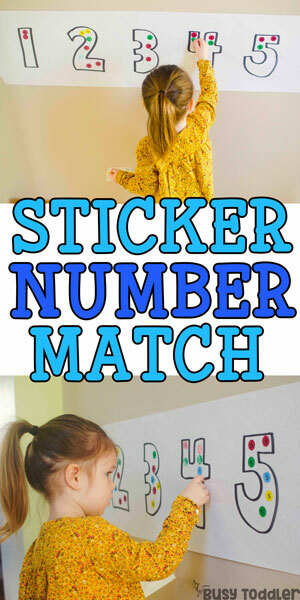 Inside: A quick and easy sticker number match activity that toddlers and preschoolers will love. Obsessed with dot stickers? Me too. I have a slight addiction to dot stickers. Oooh, you know what? Delete slight. I have a full blown addiction to dot stickers BUT in my defense, my kids do too. Strength in numbers – we are all in this dot stickers obsession together. Wish you had activities pre-planned for you each day? Check out my program Playing Preschool: 190 days of activities. Some mornings, you just need something to do to pass the time. 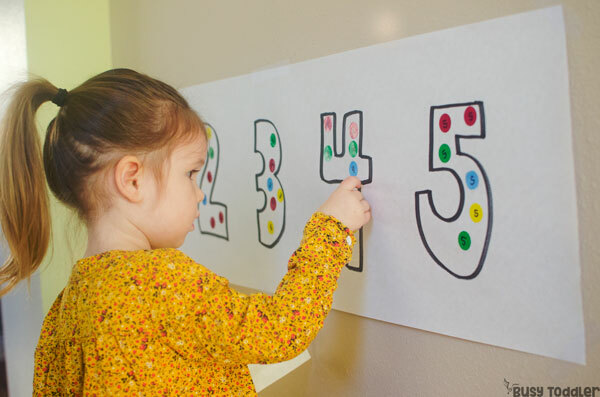 About the time I was done twiddling my thumbs and watching the clock tick backwards, my daughter (2.5) toddled in with a pack of dot stickers. Genius girl – that’s how we’ll pass the time. Related: Here’s one of our favorite dot sticker activities. See? I told you that I wasn’t the only one addicted to dot stickers. It took me a minute to decide what to do with our beloved dots – but suddenly….I knew. We needed to make a sticker number match. Side note: I love me some dot stickers but I also looooove me some butcher paper. Having a large roll of that stuff on hand makes life with toddlers so easy. It’s one of my favorite supplies. I unrolled a long sheet of the butcher paper and hung it on the wall. 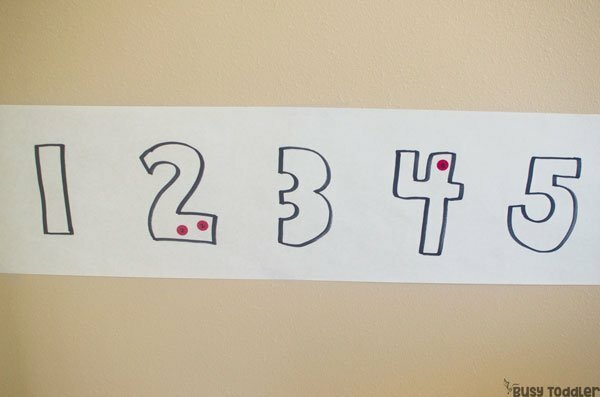 I used my giant sharpie and my bubble letter skills from high school to print the numbers 1-5 for my 2.5 year old. For my 4 year old, we did numbers 1-10. 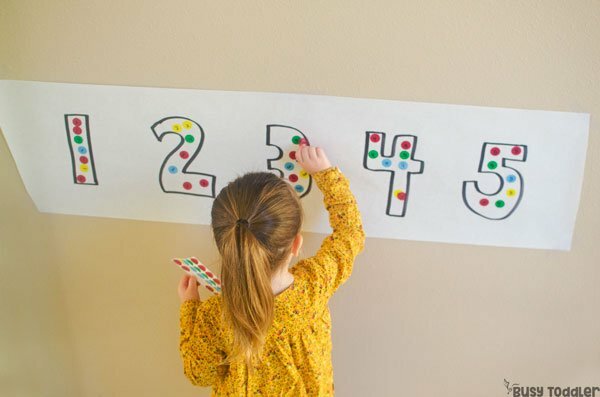 On our precious dot stickers, I wrote the numbers 1-5 and 1-10. 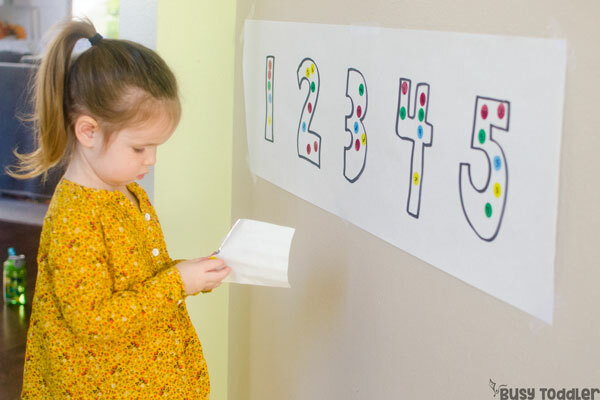 Each kid needed a few sheets of numbered up dot stickers. 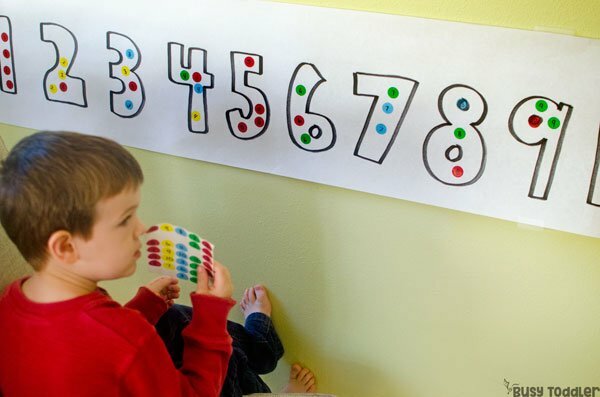 My kids loved this activity – sorting out their dot stickers onto their numbers. I made sure to mix up the numbers on their sticker sheets to make it a little more challenging to sort and match the numbers. Not ready for number matching? Try this easy color matching activity. Sticker number match occupied my kids for so long! The proof is in the sticker pudding: my kids worked for almost 20 minutes sorting their stickers. 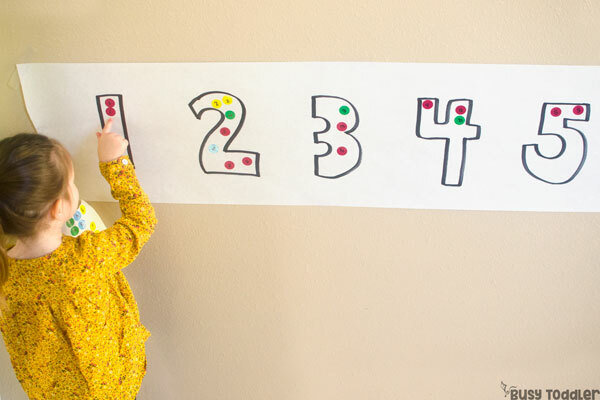 They each went through three sheets and had the best time matching the numbers up. 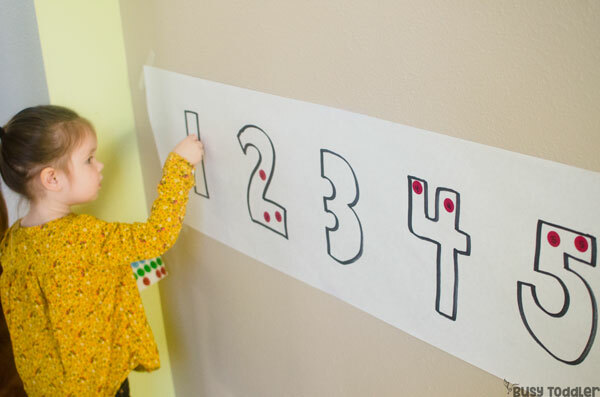 Dot stickers make for amazing tiny building blocks for toddler activities – they’re the best. There’s a reason we are all obsessed with dot stickers. They never disappoint…and they never get old. 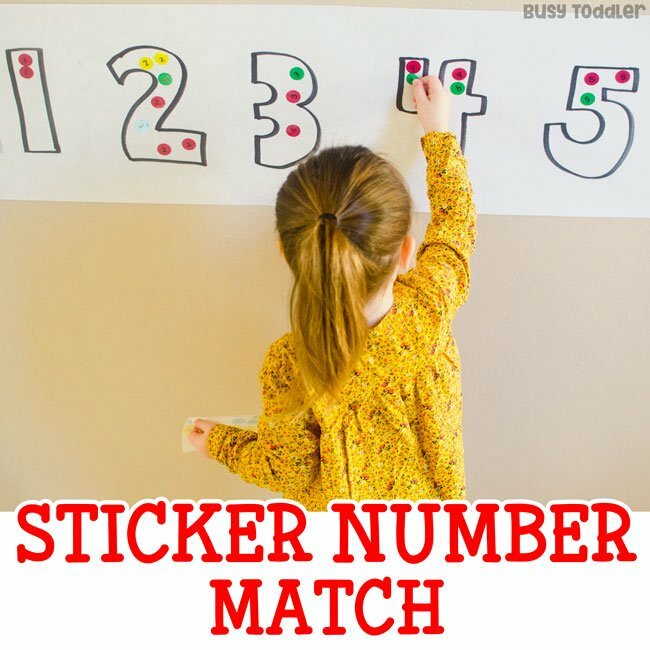 Try sticker number match with your toddler today!